I suppose today could be considered the start of our planned trip across the Ukraine. I had wanted to take in Kiev, Chernobyl, Lviv, Odessa and the Crimea, all within a two week period. My original planning took flight on the same confident wings that had taken us from St Petersburg to Moscow the previous year. However, planning any kind of travel throughout the former USSR can be a daunting task, with language and a touch of former Soviet stubbornness being the main barriers. Help was enlisted from the saintly Andrea Godfrey of Regent Holidays, who sorted everything to the finest detail, even down to booking “es vay” rail travel, ensuring we had a twin berth to ourselves; so that’s where we’d gone wrong in Russia! We left Fleetwood on a blustery autumn day and arrived at Manchester for our BA shuttle flight to Gatwick. We then spent a wonderful evening at the Arora Hotel in Crawley, which provided the perfect prelude to our adventure, with a superb meal in the restaurant followed by a particularly good Shiraz in the bar. Without a horrendously early start, we took breakfast in the hotel’s restaurant, and transferred back to Gatwick, where after a chaotic check-in, we boarded our Ukraine International flight to Kiev. The flight was excellent, and afforded me the opportunity to meet Allan Wright, who had spent some years working, living and travelling in the Ukraine, and was able to give me some useful tips. After landing, we managed to get through the cumbersome immigration system, forced to join the queue other than that for Ukrainian nationals. None of the officials here were in anything approaching a hurry, but the bonus was that, by the time we had completed this irksome process, our bags were gleefully waltzing around the luggage conveyor unaccompanied, minxes that they were. Transfer to the Ukraina Hotel took about twenty minutes, and it was delightfully placed in Independence Square right in the heart of things. Wow! With its closed off streets, 28 degree sunshine and superb atmosphere, Kiev had thrown a massive party to which we were most definitely invited. Having overcome the panic of a global ATM crash when, for a miserably long hour we thought neither of our debit cards would work in the Ukraine, we basked in the fun and games upon which evening placed no curfew. All that remained was to grab a quick McDonald’s supper and head off to bed, content in the knowledge that we already loved Kiev (or, to grant the city its correct name, Kyiv) deeply, and tomorrow we would get that rare chance to visit the site of the world’s worst ever nuclear ‘accident’. The day of our much planned trip to Chernobyl had finally arrived, and Sergey our driver arrived in his rather battered white volkswagen minibus nice and prompt at only twenty minutes late. This vehicle had certainly seen better days; maybe it wasn’t worth sending anything any newer on repeated trips into the exclusion zones. We were joined on our adventure by four amiable Polish lads and, without further ado, embarked upon our 50 kilometre journey north towards Chernobyl. A few minutes prior to the first checkpoint, we collected Dennis, our guide for the day. A fairly laid-back chap in his late twenties, he was well used to the daily grind of life in the exclusion zones; he makes the trip around sixteen times a month, getting a thorough health check every June: “so far, so good,” he told us. Before long we were having our passports examined by the officials at that first checkpoint. This was it then – we were inside the 30 kilometre exclusion zone; no going back now. First stop was the Chernobyl Interinform for a history lesson and a briefing. These are the official offices for research and management of the area and, although fairly utilitarian in look and feel, provide an invaluable base for scientists and officials alike. There is something quietly disconcerting about being asked to sign a disclaimer, promising not only that you’ll abide by all the rules (don’t step where you shouldn’t or do anything you’re told not to) but also that you’ll have no claim against the authorities should ‘your health deteriorate following your visit’ – not quite ‘abandon hope all ye who enter here’ but along the same kind of lines. Once on the road again, a surprise stop was at the Chernobyl village store. “We don’t stop for lunch until 2.30,” Dennis advised, “so buy your water and beer now.” And that set the tone for what turned out to be very much a lads’ day out; there was much beer drinking (even by the driver, rather worryingly) and a good measure of gallows humour, none of which detracted for one second from the seriousness either of what had happened here twenty-two years earlier, or what we were ourselves undertaking. A brief stop at the firemen’s memorial a little further down the road was a poignant reminder of the tragic consequences of this monumental accident; these men were cast forever in the ore that immortalised them. In real life, each was dead within six weeks of extinguishing that devastating blaze at reactor number four: not one knew the serious risk he was taking in the performing of his duty; these men were real heroes. Leaving the destroyed reactor in our wake, we next fetched up at the deserted town of Pripyat. Built in 1970, this settlement was created purely for population by the Chernobyl work force and their families. How achingly tragic it feels to wander through the dilapidated apartments, restaurant, supermarket and kindergarten, with abandoned signs of life apparent throughout – a shoe here, a doll’s head there, but nothing prepares you for the devastated fair ground. How hard it is to imagine that these bumper cars, the swings, the huge ferris wheel, were never actually ridden upon; this fun fair was set to open just five days after the accident. Now it lies empty, rotting, desolate, the big wheel stretching skywards like a huge mechanical cobweb – a timely reminder that this was once a thriving community with a future. Regular readings from Dennis’s dosimeter ranged from 700 microroentgens to a whopping 2,000 in places; permitted background radiation for Kiev is no more than fifty. One more stop gave us a glimpse of the boat graveyard, littered with vessels far too radioactive to serve, languishing away in their rusty, skeletal state. These were boats that would never sail again. After a delicious four course lunch at the Chernobyl Interinform, it was back on the road again, through both checkpoints and on to the decontamination chamber, a unit specifically set up to read our radiation levels before leaving the zone. Cleared by officials, all that remained was the ninety minute journey back to Kiev. What a way to spend a Sunday. Our evening was spent leisurely strolling around this wonderful city, soaking its electrifying after-dark atmosphere, taking a few photos and eventually settling into the Ukraina restaurant for an authentic – and delicious – chicken Kiev, washed down with a tolerably good cabernet sauvignon at just over a tenner. We’d struggled to find a bar that would sell a bottle of wine for anything under thirty quid, settling instead for a pint of ‘Newcy brown’ at the trendy underground Dockers ABC bar. After purchasing a second bottle which was intended for the third floor bar of our hotel, we were forced to retire to our room to enjoy it (”you can’t drink here – we close at eleven!” It was twenty-five past ten). Off to the room and bed, then – it would be our only proper day to explore Kiev tomorrow. After a fairly late 9am start, we took a breakfast of cold meats and cheese in the Ukraina restaurant before embarking on our own style whistle-stop tour of the city. We were never going to be able to do anywhere near as much as we wanted, so we had to pick a sensible, achievable agenda. After performing a minor miracle with our luggage, meaning we only had to take the essentials (camera, lenses, money) around with us for the day, we secured our suitcases in the hotel’s luggage room. Two stops on the metro took us to our first priority – the Chernobyl Museum. Now it might sound a bit like overkill, but it was the perfect supplement to yesterday’s visit. There were no English guides available, which merited a partial refund on the admission price, but none was necessary; the haunting images and tableaux spoke for themselves. After a couple of white beers (’Chernigivskiy Bile’) in the ninety degree sunshine and a spot of lunch, we made our way to St Sofia’s Cathedral, originally built in the eleventh century with eighteenth century baroque additions of gold domes and a wedding cake bell tower. 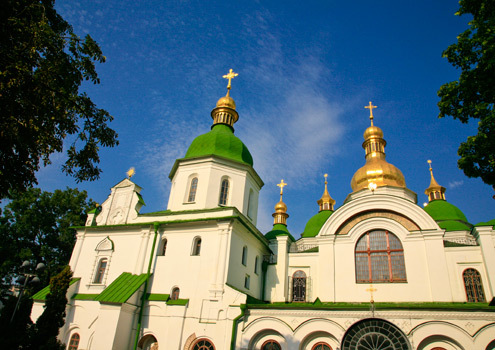 This stunning piece of architecture is truly breathtaking in its hues of gold and green, its ancient heritage providing a stark contrast to St Michael’s Monastery just up the road. You’d never believe it, but this beautiful blue and white structure, again with glistening domes of gold, is actually a modern replica of the medieval baroque style original of 1108, torn down by the Soviets in 1936 and painstakingly reconstructed to open in 2001. The funicular railway at the back of the monastery took us down to the banks of the river Dnipro, site of an amazing statue paying tribute to Ukrainian naval heroes of the second World War, before our tube took us back the one stop to vulytsya Khreshchatyk (the main street) and more beer. All that remained was for us to buy provisions (red wine, crisps, sandwiches and chocolate) in preparation for our overnight train journey to Lviv. It is in our little first class, two-berth cabin that I sit now as I write this entry, sipping elegantly on a plastic cup of wine. I suppose today could be considered the start of our planned trip across the Ukraine. I had wanted to take in Kiev, Chernobyl, Lviv, Odessa and the Crimea, all within a two week period. My original planning took flight on the same confident wings that had taken us from St Petersburg to Moscow the previous year. However, planning any kind of travel throughout the former USSR can be a daunting task, with language and a touch of former Soviet stubbornness being the main barriers. Help was enlisted from the saintly Andrea Godfrey of Regent Holidays, who sorted everything to the finest detail, even down to booking “es vay” rail travel, ensuring we had a twin berth to ourselves; so that’s where we’d gone wrong in Russia. Brasserie Monopole – a Mestreechs delight on Vrijthof!